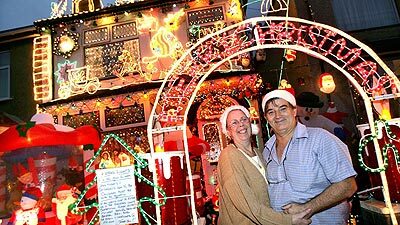 Bernard and Denise Lumsden have decided to stop a 20-year tradition of covering their house in decorations – featuring some 50,000 bulbs – because they can no longer afford it. The pair, from Brislington, Bristol, last year had a Â£1,200 electricity bill – double the cost of the previous year. And rising energy prices would likely have seen the cost skyrocket further this year. The couple also have to pay more than Â£300 to make sure their grotto-like semi is safe for the public. So despite the display raising Â£15,000 for children’s charities, Mr Lumsden, 58, is now selling his collection of lights, decorations and accessories. The father-of-three, a retired lorry driver, said: “We are both so sad and choked up about it. Just talking about it is upsetting. “We are going to miss seeing the big smiling faces on the children and the mums, dads and their grandparents. “Three generations have been coming to see your lights and it’s going to be very weird not having them around. In 2006, the Lumsdens’ home in Savoy Road was crowned the best decorated house in the country, after a vote on national television. In its heyday the place was adorned inside and out with dazzling lights and decorations.